Stocks in London and Europe plunged headlong into some of their biggest falls in years after the U.K. voted to leave the European Union. As the day progressed, the market panic calmed down a bit and London's main FTSE 100 index recovered, closing with a loss of 3.2%. Earlier in the day it had plunged by nearly 9%. But London's FTSE 250 index, which tracks 250 mid-sized companies, closed the day with a loss of 7.2%. Many analysts see the FTSE 250 as a more accurate reflection of the British economy because it tracks firms that do more of their business inside Britain. The pound quickly dropped to its lowest level in more than 30 years against the U.S. dollar as the U.K. voting results came in. It's now trading around $1.36 after previously trading at $1.50 on Thursday evening. Other European markets also plunged following the surprise result, with many posting larger losses than the London markets. Germany's DAX index dropped by nearly 7%, while the French CAC plunged by 8%. Stocks in Ireland closed with a loss of nearly 8%. 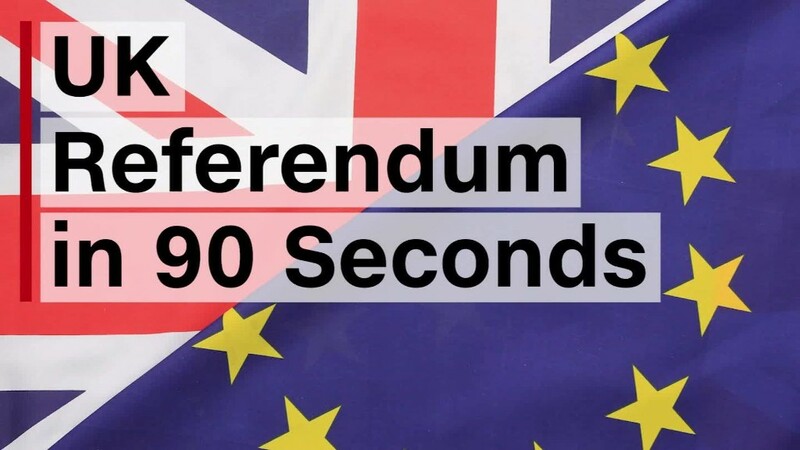 The U.K. is the first country to vote to leave the European Union. Prime Minister David Cameron resigned after the vote, saying he will stay in the office for the next three months. "The financial markets have certainly taken the view that the decision to leave the European Union is bad news for the United Kingdom in the near term at least," said Howard Archer, chief economist at IHS. As the market fell Friday, the Bank of England governor, Mark Carney, stepped in to try to reassure investors. He said the bank will take all necessary steps to maintain financial stability. "As a backstop, and to support the functioning of markets, the Bank of England stands ready to provide more than £250 billion of additional funds through its normal facilities," Carney said. Despite the soothing words, banking stocks were among the biggest losers on the London markets on Friday. Shares in Lloyds Bank (LYG) crashed by 21%, Royal Bank of Scotland (RBS) dropped by 18% and Barclays (BCS) fell by nearly 18%. Shares in German bank Deutsche Bank (DB) fell by 14%. London is the world's leading financial center and the vote to leave the EU has triggered huge uncertainty about the future of its banking sector. The vote to leave the EU also rattled the U.K. real estate market. The biggest loser on the FTSE 100 was homebuilder Taylor Wimpey (TWODF), whose shares dropped by more than 29%. On the flip side, shares in London-traded gold miner Randgold Resources (GOLD) shot up by 14% as people tend to shove their money into gold when the markets are panicking. Unlike many major markets around the world, the London Stock Exchange doesn't have mechanisms to halt trading in all stocks if there's a crash. But it can suspend trading in individual shares.